Sunshine Village has a long and successful history of environmental sustainability, recreation and hospitality for park visitors. In the mid 1920’s the Canadian Pacific Railway built a trail rider’s cabin (Trappers) for overnight accommodation and recreation in what is now Sunshine Village. Commercial overnight guest accommodation has been available, first for summer use only and since 1934 for both summer and winter use. The first rope tow was installed in 1942. Starting in the 1960’s, chairlifts were installed and over the following decades additional terrain, lifts, and facilities were developed. In 1983, a Sunshine Summer Use Plan was adopted. The summer of 1984 saw the opening of the gondola for its first ever summer season. The Rock Isle Interpretive Trail and the Sunshine Meadows Visitor Center were inaugurated. The Sunshine Inn was also reopened for summer guests. More recently, the resort’s ski facilities have been going through a renaissance of renovated buildings and new lift technology installations. Sunshine Village site guidelines will provide direction for integrated delivery of heritage resource conservation, world-class visitor experiences and public appreciation and understanding for the natural alpine environment. It sets out a vision for the future that seeks to protect the unique natural and cultural heritage of the mountain resort and provide memorable experiences that allow Canadians and International visitors to connect in meaningful ways to the mountain heritage. The future at Sunshine Village will be about strengthening connections among people and the landscape by managing Sunshine Village as an inter-related part of a much larger regional ecosystem. Sunshine Village will contribute to a unique, memorable national park experience, promoting public appreciation and understanding of the heritage values of the park and world heritage site and local conservation initiatives. The level of development in Banff National Park is unconventional in a national park context and has come to define the park almost as much as do the unparalleled mountain scenery, healthy ecosystems, mountain culture, opportunities for wilderness adventure and its role in Canada’s history. Sunshine Village occupies less than 1% of Banff National Park yet hosts many of its visitors from around the world. The anomaly in Sunshine Village offers opportunities to enlarge on the significance of this place and its national park status by turning this exception into the exceptional. Utilizing best practices, stewardship, thoughtful design and programing, adaptive management, and interpretive educational opportunities provides an active way to engage and involve visitors to create dialog and learning opportunities to influence thinking and offer hope for the future within the national park and beyond. Visitors will be welcomed to nature, beauty, culture and adventure by ensuring that “welcome” is a recurring theme at each stage of the trip cycle for visitors. They will be connected to exceptional experiences by offering a comprehensive range of leisure, recreational, and learning opportunities by continually reviewing and refreshing the visitor products offered. This will include engaging visitors in stewardship activities, making the protection and management of the resort an enriching source of meaningful experiences. Sunshine Village is not Vail or Whistler. It does not have thousands of condos, hotels, and second homes. There is no sprawling development. We embrace this difference and view it as an important part of what makes Sunshine Village unique and special. It is located in a UNESCO World Heritage Site and the beautiful Banff National Park. It is a model of stewardship and offers a world-class visitor experience. Canadians and visitors from around the world are drawn to the deep powder snow, exceptional alpine skiing, outstanding vistas, modern lifts, beautiful lodges, high-quality culinary experiences, an exceptional boutique hotel and spa, and the uniquely Canadian National Park ambiance. Educational visitor programs offered to tourists in the summer interpret and share the spectacular surrounding natural environment and the historical context of the Main Ranges of Banff National Park. An interpretive trail guide staff is available every day during summer operations to educate the public about the heritage and environment of the surrounding area, “leave no trace” practices, and assure that people stay on the developed trails. Overnight accommodation in the village allows visitors to enjoy night-time serenity in the attractive alpine settings. Developed facilities are modern, attractive, and accessible to all ages and abilities. Dated and unsightly buildings will be removed and replaced. Ski terrain, lift access, commercial space, parking, staff accommodations, and administrative/operational/maintenance facilities are balanced and sized correctly for the design capacity at build-out (8,500 people-at-one-time maximum). Sunshine Village is a skier and snowboarder paradise, with spectacular “view from the edge” experiences that serve as an introduction to the park in a controlled operational environment that protects the ecological integrity of the area. Offer a truly world-class alpine resort visitor experience while protecting the integrity of the natural environment. Accurately define and illustrate allowable resort development components, uses, and provide certainty to Sunshine Village Corp. that the resort will be allowed to implement the same. Secure growth limits on the design capacity, intended uses, and development components and provide certainty to Parks Canada of the same. Define the implementation strategy and conditions in connection with the mutually agreed upon Significant Environmental Gain components. Utilize licence of occupation (LOO) permits to implement the agreed upon development and use components outside of the leasehold boundary. Provide additional appropriate alpine recreation opportunities in the summer in order to offer an unparalleled world-class visitor experience at Sunshine Village on a year-round basis. Provide sustainable water and wastewater infrastructure and treatment based on the design capacity of the resort. 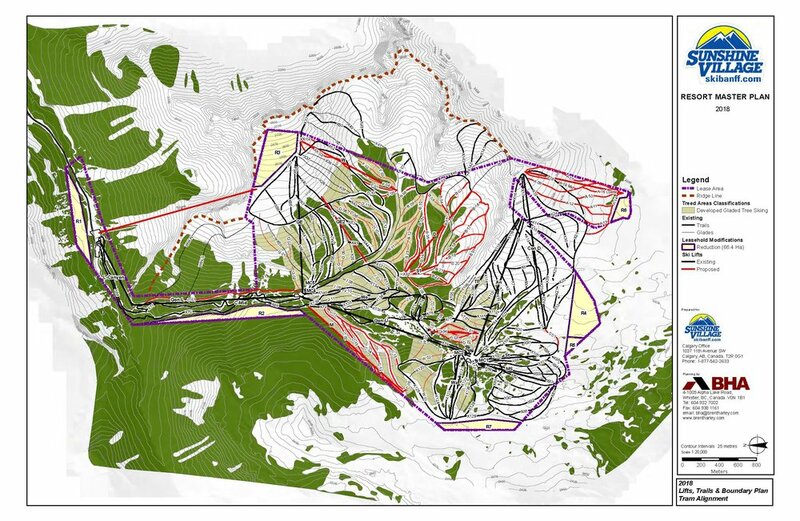 Master Plan the recreational uses, support facilities, and parking so that upon build-out, a balanced world-class alpine resort is realized. Provide experiential heritage and environmental educational programs for the visiting public. Attract and retain exceptional staff and service providers through enhanced staff accommodations and workplace design.